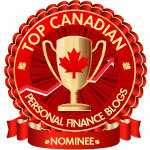 Canadian Financial DIY: Socially Responsible Funds: Who's Got it Right - RBC or iShares? Socially Responsible Funds: Who's Got it Right - RBC or iShares? Here's an interesting situation. Compare the standard iShares Socially Responsible Canadian equity fund XEN with RBC Asset Management's version RBC302. XEN is passive and has an MER 0.55% while RBC302 adds a layer of active stock picking after applying the same Jantzi social screen as XEN and it sports a much higher MER of 2.1% (on series A, non-advisor class). RBC302's annualized 5-year return of -0.12% (per Morningstar), including the all-important adjustment for fees, beats XEN's -1.12% (per the Globe Watchlist) by a whopping 1% per year!! and the benchmark cap-weight market fund iShares XIU's -0.83% (also from Globe WatchList) by 0.71%! Of course, the data might not be strictly comparable coming as it does from different sources - why the heck can't the data providers give us ETFs and mutual funds together since most investors want to compare the two?! That's right, an actively managed high-MER mutual fund has beaten the index by a good margin, even after fees. 1) RBC has been good at excluding a number of stocks that have been losers. RBC's final investment decision-making step, after the initial screening for the Jantzi social criteria, is to pick stocks with "... above-average financial fundamentals while considering broader factors, such as economic trends, interest rates and the outlook for profits, valuations and stock prices". 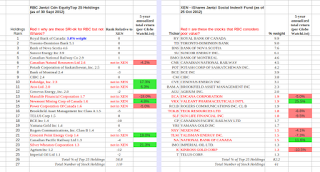 We only have the top 25 stocks to look at, since RBC doesn't reveal the whole portfolio, but the holdings differences between RBC302 and XEN are significant. 8 stocks are different. The spreadsheet shows in red, which stocks do not appear in the top 25 of the other. Of the 8 in XEN, but not in RBC302, six have significantly negative annualized 5-year total returns. 2) RBC seems to be fairly good at picking winners. As for the stocks in RBC302 that have replaced those losers, 5 out of 8 are 5-year positive and the positives are stronger than the negative. It's interesting that RBC302 is much less concentrated than XEN. It's top 25 only add up to 56.8% of assets vs 82.2% for XEN. RBC is no closet indexer with this fund! Is "socially responsible" inclusion partly in the eye of the beholder? 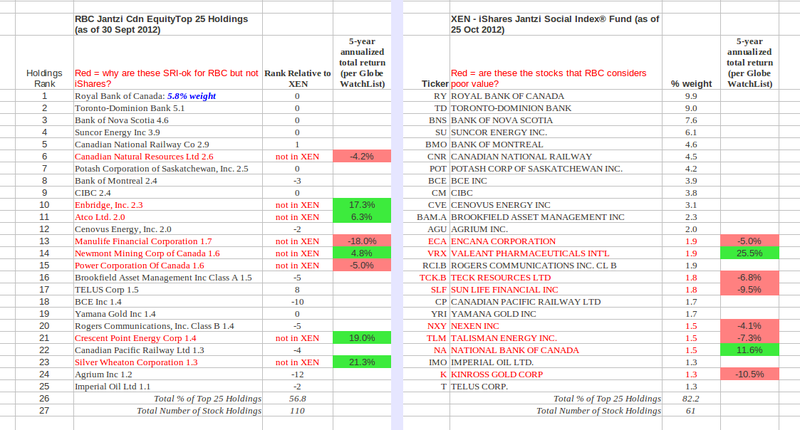 Not a single one of the red stocks in the top 25 holdings of RBC302 appears anywhere in XEN, not in the top 25 of XEN, nor within the 61 total holdings of the XEN. Yet all of these stocks are large enough to appear in cap-weight benchmark XIU. What is going on? XEN is strictly a Jantzi index tracker so those stocks must have been screened out as unacceptable according to socially responsible criteria. How the heck does RBC get to put them back in? Unfortunately, the Jantzi index composition and its exact methodology are not disclosed so we cannot go back to the true source to figure this out. It would be ironic if RBC has been beating the virtuous socially responsible index by cheating! 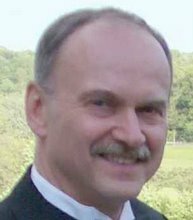 Thanks to Ken Kivenko for the pointer to the RBC Jantzi funds.